WESTVILLE, Ind.—Sen. Joe Donnelly said he voted against Justice Brett Kavanaugh’s confirmation because it is his job to protect the court. Republican challenger Mike Braun said Donnelly made the wrong decision voting no. 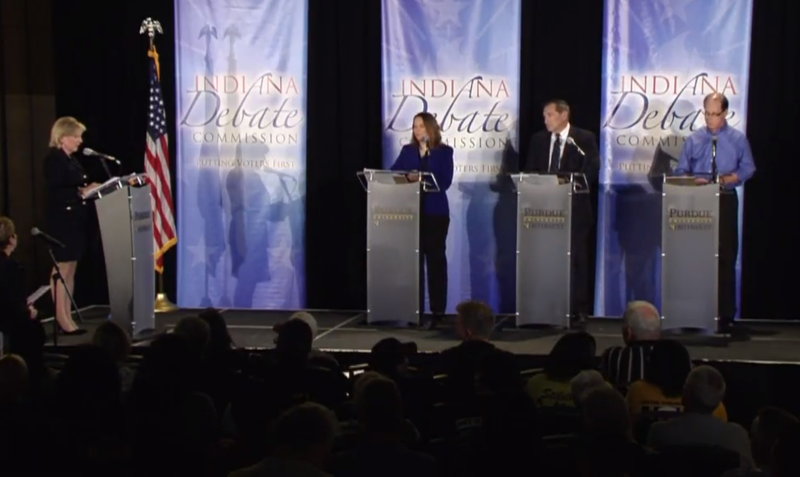 The two came out with an aggressive tone to begin Monday night’s Indiana Debate Commission U. S. Senate Debate at Purdue University Northwest in Westville. “If Pres. Trump had put up Bugs Bunny, Mike would have said he should go on the court,” said Donnelly, attacking Braun, saying he has no independence from Trump. Donnelly said in answers to questions following the debate that he believes Hoosiers sent hiom to DC to use his experience and judgement, and that experience is what helped him make his decision. "He apologized for the way he acted, for his lack of judicial temperment," said Donnelly. He said Kavanaugh did not pass his test, a test by which he measured and supported Justice Neil Gorsuch. For most of the night, the debate was one-two punches by Donnelly and Braun, and calls for no government interference by Brenton, who is pro-life, but does not believe the government has a say-so on abortion, marriage, or whether you are able to use hard drugs. “Mike, you need to do more than take your tie off to protect the people of Indiana,” said Donnelly. “You’re gonna need to look at leadership,” said Braun, saying his business record is his experience. Donnelly said he has voted with Trump 62 percent of the time. But, Braun said Donnelly voted for Democrat causes like ObamaCare because he follows the lead of the national Democrat party. Braun said he had an independent record in the state legislature. “It’s going to be an awfully long evening if we just listen to them repeat their commercials,” said Brenton, who repeated the Libertarian mantra of living as you wish without hurting others. Braun contended that Donnelly has gotten too comfortable in DC, and will do anything for a campaign contribution. Braun said his political role model is Tom Coburn, former Oklahoma senator, who frequently criticized the government for spending practices. Donnelly said his role model is John McCain, Republican senator now deceased, for his motto, “country first”. Brenton’s role model was Abe Lincoln for his policy of making his enemies his friends, thereby destroying his enemies. Braun said his environmental policy is energy independence. Donnelly said he’s pro ethanol because it’s made in America, and that we should leave the environment cleaner than we found it. Brenton said she has boycotted Nestle since 1993 because they are draining Lake Michigan, she said. “We need hemp, we need hemp, we need hemp,” said Brenton. Braun said he will always defend 2nd amendment rights. Donnelly said he is pro 2nd amendment, but believes there should be limits. After a question from a mother who lost her child when that child was shot by an unsecured handgun at a babysitter's house, Donnelly said he would support a storage law. The next debate is Oct. 30, in Indianapolis.